I’ll say it: it’s been rough since the election. Like so many other people, I was thrown into a state of reflection about my country, the world and my role in it. I’ve struggled with understanding how I can live in a world where it seems facts don’t matter. It’s been reassuring to see so many of my friends, family and colleagues (many of them lawyers!) become invigorated to work in the public good. This has all left me with some real self-reflection. I’ve been passionate about software freedom for a long time, and while I think it has really baffled many of my loved ones, I’ve been advocating for the public good in that context somewhat doggedly. But is this issue worth so much of my time? Is it the most impactful way I can spend my time? I think I was on some level anticipating something like this. I started down this road in my OSCON EU keynote entitled “Is Software Freedom A Social Justice Issue,” in which I talked about software freedom ideology and its place relative to social justice issues. 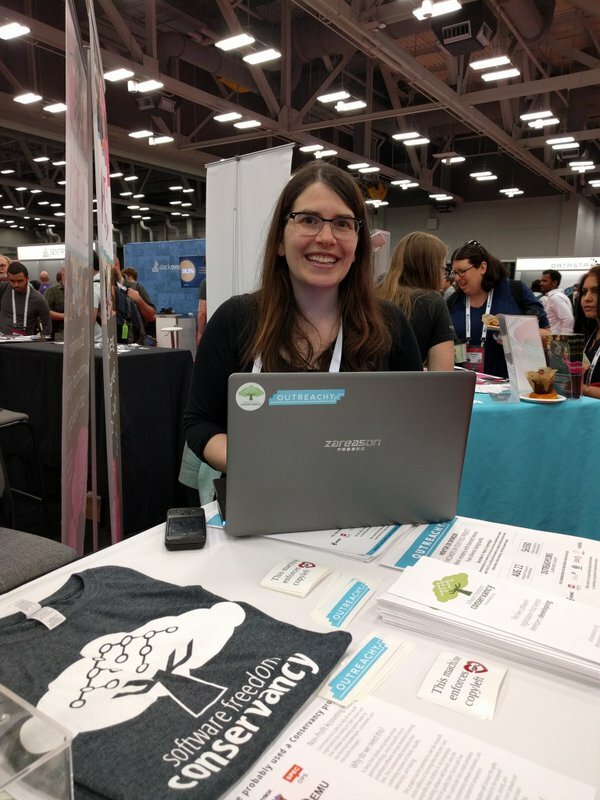 This time, like when I was doing the soul searching that led to the OSCON EU talk, I kept coming back to thinking about my heart and the proprietary software I rely on for my life. But what’s so powerful about it is that my heart is truly a metaphor for all of the software we rely on. The pulse of our society is intertwined with our software and much of it is opaque from scrutiny and wholly under the control of single companies. We do not have ultimate control of the software that that we need the most. After all of this deep reflection, the values and the mission of software freedom has never seemed more important. Specifically, there are a few core pieces of Conservancy’s mission and activities that I think are particularly relevant in this era of Trump. One the things I’ve focused on in my advocacy generally is how vulnerable our core infrastructure is. This is where we need software freedom the most. We need to make sure that we are doing our best to balance corporate and public interests, and we need to be able to fix problems when they arise unexpectedly in our key systems. If we’ve learned anything from Volkswagen last year, it’s that companies may be knowingly doing the wrong thing, covering it up while also promoting corporate culture that makes it extremely unlikely that employees may come forward. We need to have confidence in our software, be able to audit it and be able to repair it when we detect vulnerabilities or unwanted functionality like surveillance. Software freedom, and copyleft in particular, helps us keep the balance. Conservancy is dedicated to promoting software freedom, defending our licenses and supporting many of our member projects that are essential pieces of our infrastructure. While hate and exclusion are on the rise, it’s more important than ever to make sure that our own communities do the right thing. I’m proud to have Conservancy host and to also personally help run Outreachy, making sure that many of the groups that are now feeling so marginalized have opportunities to succeed. Additionally, software freedom democratizes access to technology, which can (in time) empower disenfranchised communities and close digital divides. Perhaps most importantly, unethical software is something that everyone is vulnerable to, but most don’t understand it at all. You need a certain level of expertise just to understand what software freedom is let alone why it’s so important. There are many things we can and should work on, but if we don’t keep our focus on software freedom the long term consequences will be dire. Software freedom is a long-term cause. We must work towards sound infrastructure and look after the ethical underpinnings of the technology we rely on, because if we don’t, who will? We can’t just be reactive. We have to build the better world. Please join me in doubling your efforts to promote software freedom. If you can, help Conservancy continue its important mission and become a Supporter now. Employment agreements are one of the things that I’m asked the most regularly about in the free and open source software world, almost rivaling questions about licenses. My responses have always been the usual lawyerly responses of This Is Not Legal Advice and while I Am A Lawyer, I Am Not Your Lawyer (I’m generally not acting as a lawyer on behalf of Conservancy as its Executive Director either). But even from my early days of being involved with free software, I have seen that there’s a lack of understanding about employment agreements and the ability of employees to get their agreements modified. Last month, Fred announced a new initiative that we are working on together, called ContractPatch. With ContractPatch, our goal is to help provide knowledge to employees, along with sample language for better contract terms. The first step in this process is understanding the dynamics at work in employment arrangements. Step 1 is knowing that everything is negotiable and step 2 is knowing where you stand in the negotiation. Quite simply, you likely will never have as much power as you do the moment just before you sign your employment agreement. At the point you are presented with a job offer, your prospective employer really wants to hire you. Chances are, they’ve screened and interviewed a number of candidates and put a lot of work into the process. Your manager has thought deeply about who they want in the position and has probably imagined how it will all work out with you in the role. Both you and the hiring decision-maker(s) are probably very optimistic about what you’ll accomplish in the role and how well you’ll get along working together. At this point, no one wants to go back to the drawing board and start the process over again. You will be excited to start the new job but it’s worth taking a step back to appreciate the unusual position you are in with your new employer. As part of the hiring process, you’ll be expected to negotiate your salary (this can be complicated) and finalize all of the terms of your employment. Terms of employment can also be looked at through the lens of compensation, and asking for more favorable terms in your employment contract can be another kind of perk an employer can give you if they have a tight budget. A classic contract negotiation tactic (I even learned this in law school) is to make an agreement stronger in the first draft than you really need it to be, just so that you can give something away when pushed. This is certainly true of many company’s standard agreement templates. The only way to find out is to ask. Once you take the job, it’s harder to change your terms of employment (though it’s possible, as we’ll cover later). Think hard about the long term impact of signing the agreement and whether things could happen down the road that would make you feel less comfortable with working under those terms. We’ll be giving you some examples of situations you want to be prepared for when we talk about specific contract provisions. Asking for more favorable terms doesn’t have to be an adversarial process. You can ask for an agreement to be amended in a friendly way. Employers often respect workers more when they advocate for themselves. So, we’ll help you think about how to engage with your employer while anticipating things that could go wrong down the road and how to ask for more favorable terms. You can sign up for our mailing list to be part of the conversation. While it may be easier to avoid negotiating your agreement, don’t trade short term comfort for your long term benefit. I participated in two sessions on Thursday. One was a talk I gave on employment agreements. I outlined basic issues to look for in signing an employment agreement but my main point was that employment agreements can often be negotiated. Companies have standard contracts that they use for all employees, but in many areas they may be prepared to edit the agreement as part of an onboarding negotiation. After you receive your offer, but before you sign the employment agreement, you are likely to have more power in the relationship than you will again. The company has expended resources in recruiting and interviewing you, and has come to the decision that you’re the best person for the job. Just as you negotiate your salary and other important terms of employment, some of the contractual provisions are also likely to be flexible. I’ve seen a lot of agreements over the years, and every time I’ve talked to someone about this issue they’ve been able to get *some* change. Because of this, and because it’s so hard to know what to ask for if you’re not a lawyer like me, Conservancy is working on a project of standard employment agreement provisions that could be worth asking for. If many prospective employees ask for this, some companies may start to give this as a perk to attract top talent. Lastly, it was great to meet with other Outreachy organizers! We don’t have a chance to meet in person very often and we always have so much to discuss. After the conference ended on Thursday, we had a chance to relax and talk about the conference with Conservancy Supporters at our pool party. I’m always struck by how impressive our Supporters are. While walking around the party, I caught conversations about the future of free software, copyleft, enforcement, patents, conferences and even one where we recruited someone great to apply for the GNOME Executive Director job! I was so excited by the enthusiasm of our Supporters. Aside from the financial aspect, which is critical for us, with such a small staff it would otherwise be impossible to do all of our work and tell people about it without their help. While it’s taken me all week to recover from the conference and try to catch up on the backlog of work that piled up, I feel reinvigorated and recharged! Of course, we’re still excited about our for-profit sponsors, and list them at the top of our sponsors page. We’d like to draw particular attention to Private Internet Access, which gave a generous match so that individuals who join this month will double their donations via the match. We have only two weeks left to take advantage of this, so if you are considering donating, please do it soon! Conservancy is focusing on individual giving via our Supporter campaign because our organization has a very special and unique status, called 501(c)(3) charity status here in the US. That means that Conservancy’s constituency is the general public. We do the jobs in the software freedom community that maximize the rights of the general public in the use and development of their software. We’re glad that so many support us in doing those jobs for public good. But Conservancy doesn’t imagine that we can do all the jobs in our community. In fact, there’s a definite need for companies to have an organization that specifically represents their interests in the software freedom community. In my view, the organization that does the job best is the Linux Foundation. Linux Foundation is a 501(c)(6) trade association, so they advocate ultimately for the common business interest of their members. I’ve been impressed at Linux Foundation’s growth and their increasing ability to market Linux and related free software technologies to new companies; no organization does more to encourage companies to adopt Linux than Linux Foundation. by individuals.1. This gives individuals a minority voice on their Board of Directors, so that companies that control Linux Foundation’s board has a direct path to hear for the community. While the focus of my work is at Conservancy, I really believe that all of us should give time to other organizations in the community to make all of them better. 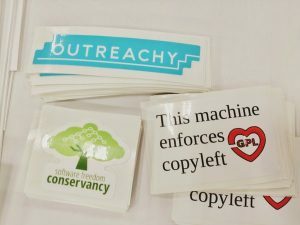 Conservancy announced in the last two years multiple collaborations (such as our GPL enforcement principles and copyleft.org) with the Free Software Foundation, and I have long provided pro-bono legal counsel to both the FSF, GNOME Foundation and Question Copyright, in addition to my job at Conservancy. I also try to contribute whenever I can to the GNOME engagement team. While I do believe prioritizing volunteer work for charities is ideal, I also see an opportunity here, as I said in my Linaro keynote, to help companies understand the needs and mindset of community and non-commercial developers who also collaborate on key software freedom projects. I hope that platform will find resonance with Linux Foundation’s Individual Affiliates, and I ask for their votes. I’m back from Brazil where I attended FISL. I had the honor of presenting three talks! 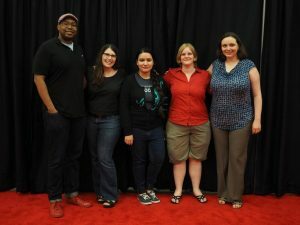 And they were three of my favorite topics: the importance of compliance and the suit against VMware, bringing more women to free and open source software and why I care so much about software freedom in the first place. It was a very fun conference. Besides doing the talks I was able to do a few press interviews too. And of course I loved meeting Brazilian hackers and software freedom activists. Attendees seemed very interested in enforcement and the VMware suit. I was happy to see support for this work, and there was discussion about local copyright holders signing up to the coalition. 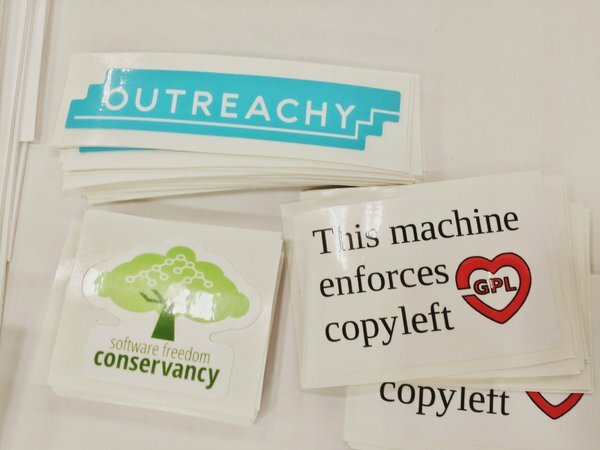 It really seems that folks are starting to see the downsides of noncopylefted projects and are frustrated by the pervasiveness of GPL violations. One of my favorite moments of the conference was the response to my talk about gender diversity. I admit that it’s disappointing that this talk is always attended disporportionately by women. As I sometimes say in the talk itself, it doesn’t make a lot of sense for the burden of this work to fall only on women. There are so few women right now in free software (1-11% at most) that it would be impossible for us to do it on any meaningful scale alone. Plus it’s not fair to expect women to undertake this work on top of their other contributions to free software (many women understandably don’t want to think about gender issues at all). Men can make a tremendous impact on this area. 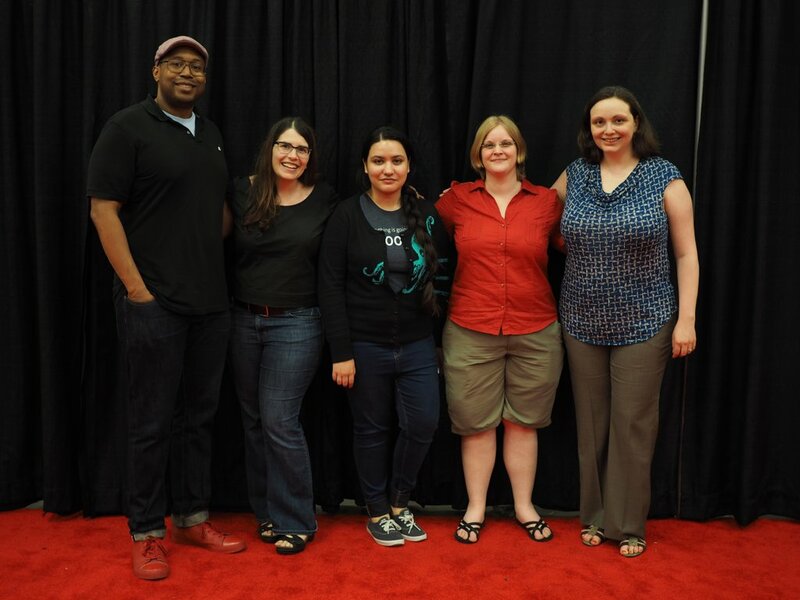 Most of our Outreachy mentors are men, and as the dominant group in free and open surce software, it’s men who can fundamentally change the culture to be more welcoming to women and other underrepresented groups. Nonetheless, it was amazing that the “mob” after my talk was mostly women. It was great to meet so many women who are leaders in Latin America and to hear about their extraordinary work. 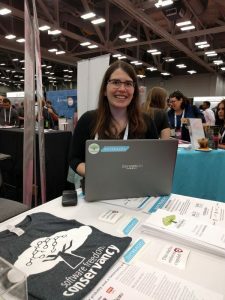 I was interviewed after the talk and was askd to give some tips for women getting started in free software. The conference had a very different feel to it than a lot of the other conferences I attend. It was a community run conference (along with that awesome community feeling, a lot of students, etc.) but it’s such a big conference that it has some things that community conferences often don’t have. 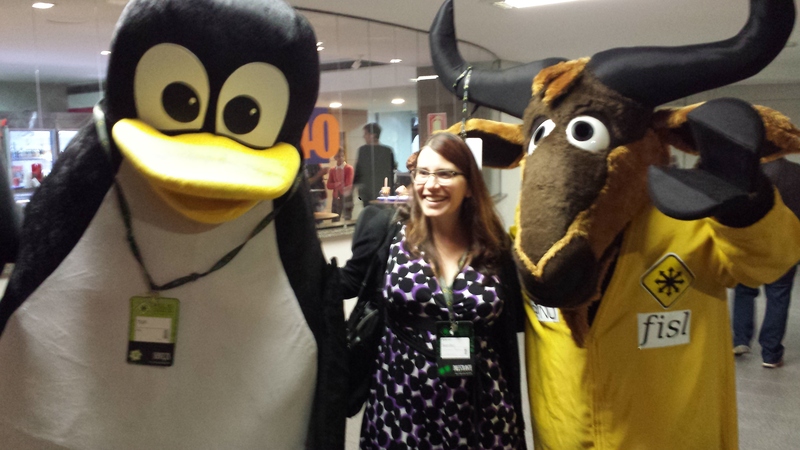 Like GNU and Tux mascots (thanks to Deb Nicholson for the photo)! I loved seeing schoolkids excited to be there and quite a number of really little kids with GNU and Freedo shirts and toys. There was also a lot of love for GNOME, and it was great to meet up with people I don’t get to see very often, especially since I’m missing GUADEC this year. Plus we got to settle some outstanding Linux kernel/systemd issues. It’s been a really long time since I’ve blogged and Oliver Propst is here in New York and since I’ve been telling him about GUADEC I realized that instead I should write it all down! Getting to GUADEC was very exciting for me as I finished my talk at OSCON and then ran straight to the airport in order to make my flight. Unfortunately this meant that I missed the first day of GUADEC in addition to the all day board meeting the day before. All of the travel was worth it when the bus pulled into the station in Strasbourg to find Rosanna and Sri waiting for me! We walked over to the bar gathering and it was fantastic to see everyone and catch up and I was immersed in GUADEC all over again. It was really fun to be at GUADEC and definitely a different experience than as Executive Director. There were so many great talks that it was often hard to choose between the two tracks. I loved volunteering to help with sessions and felt pretty privileged to introduce two of the keynotes: Nate Willis and Matthew Garrett. Nate spoke about automotive software with the cool narrative of hacking his own car. I loved that he tied it all back to GNOME with practical recommendations for the community. Matthew gave an incredibly inspirational talk about GNOME and its future. I highly recommend watching the video when it comes out if you didn’t get a chance to see it in person. I think we’ll have a lot to talk about over the next year and a lot of work ahead of us too. I spoke about what I learned as Executive Director of GNOME. It was nice to reflect over the years I spent in the role and also to provide some recommendations going forward. The GNOME community is exceptional and if we can prioritize attracting newcomers and communicating better about why we do what we do we’ll be unstoppable. I proposed that we have technical evangelists for GNOME so that we have the ability to appoint our most articulate and charismatic community members as representatives. I think the GNOME community needs to go to companies and talk to them about GNOME and help them with their GNOME usage (or potential GNOME usage). Happily two extraordinary people volunteered after my talk so we’ll see! All of the board meetings were a bit grueling but I think good discussions were had. And the marketing hackfest was fun and productive as usual. I would be remiss if I didn’t mention all of the hard work of Alexandre and Natalie who made GUADEC run so smoothly, even in a venue that they had to scramble to arrange when the original venue fell though at the last minute. Happily, Alexandre was the winner of the coveted Pants Award this year, so we had multiple opportunities for our community to express our gratitude. I also had a blast shining the bright light of truth on the Swedish Conspiracy. And I’m looking forward to GUADEC in Goethenburg too! Thanks to the GNOME Foundation for sponsoring my travel! three years. GNOME is such an important, vibrant project, and I feel lucky to have been able to play a part in it. I think I have made some important contributions to the project while I have been Executive Director. I’ve helped to recruit two new advisory board members, and we recently received a one time donation of considerable size (the donor did not want to be identified). Financially the Foundation is in good shape, and we have run the last three years in the black. We’ve held some successful funding campaigns, particularly around privacy and accessibility. We have a mind-blowingly fantastic Board of Directors, and the Engagement team is doing amazing work. The GNOME.Asia team is strong, and we’ve got an influx of people, more so than I’ve seen in some time. I hope that I have helped us to get in touch with our values during my time as ED, and I think that GNOME is more aware of its guiding mission than ever before. The ongoing success of the Outreach Program for Women and positive relations with other organizations fighting for software freedom have all helped us to tell a powerful story about who we are and why we matter. With all these achievements, I think it’s time for me to hand the reins over to someone new, who can bring their own personal strengths to the role. It is time for a new challenge for me also, so today I am announcing my new position as the Software Freedom Conservancy Executive Director. As many of you know, I have been volunteering with Conservancy for some time, since I helped found it when I was a lawyer at SFLC. I also can’t wait to work closer with Bradley, who has done a bang up job in the role of ED thus far (he’ll be taking on the title of Distinguished Technologist while remaining President and on the board). It is an important organization where I think I can make a difference, and GNOME is in good hands. Don’t worry though: I’m not leaving GNOME. I will be announcing my candidacy for the board when the call comes out (this is a real exception for me as I’ve generally declined serving on boards). I will stay on as pro bono counsel, and of course I’ll continue volunteering in other ways. The Conservancy has also agreed to partner with GNOME, so that I can help to run the Outreach Program for Women with Marina. I’m excited for the future. GNOME is already in great hands and I look forward to what the next Foundation Executive can bring to the table. If you know of someone who would be fantastic in this position please let the GNOME board know! I am incredibly proud of what we have achieved in the past three years, and can’t wait to see where we go next.